Collins caught 74 passes for 1182 yards and 12 touchdowns in college and was a consensus first-team All-American in 1961, placing eighth in balloting for the Heisman Trophy. 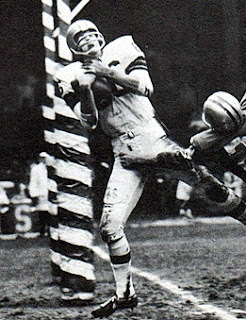 The Browns chose him in the first round of the 1962 NFL draft (fourth overall; the Boston Patriots picked him sixth overall in the AFL draft) and he did more punting than pass receiving during his rookie season. He caught 11 passes for 153 yards (13.9 avg.) and two TDs as backup to flanker Ray Renfro and punted 45 times for a 42.8-yard average. Browns went 10-4 to finish second in the NFL Eastern Conference while leading the league in rushing (2639 yards). Collins followed his breakout season by catching 35 passes for 544 yards (15.5 avg.) and eight touchdowns in 1964, and had a noteworthy performance in the NFL Championship game win over the Colts with his three TD receptions. He continued to be a reliable clutch receiver and was named to the Pro Bowl for the first time in ’65 and received some first-team All-NFL recognition as he caught 50 passes for 884 yards (17.7 avg.) and 10 TDs and also led the league with a 46.7-yard punting average. Collins achieved career highs in receptions (56) and yards (946) in 1966 and was again selected to the Pro Bowl, as well as garnering second-team All-NFL honors. A shoulder injury limited him to five games in 1968, but he bounced back with 54 catches for 786 yards (14.6 avg.) and 11 touchdowns in ’69, when he again received first-team All-NFL honors from NEA and the New York Daily News. He ended up playing 10 seasons through 1971, all with the Browns, and totaled 331 catches for 5299 yards (16.0 avg.) and 70 TDs. He added another 19 receptions for 275 yards (14.5 avg.) and five more touchdowns in the postseason. Collins also punted 336 times for a 41.0 average. He was twice named to the Pro Bowl, received at least some first-team All-NFL honors after two seasons and either second-team All-NFL or All-conference recognition after two others.